Gotta love fellow writers! Author and blogger, Evelyne Holingue, has tagged me on the ‘Meet My Main Character Blog Tour’. Thanks, Eveylne, I’m honoured to take part. Evelyne is a Frenchwoman now living in the United States. She writes in both languages and is a very talented lady. She’s the author of Trapped in Paris, a thrilling young adult novel set on a background of loss. You can find out more about Evelyne and her work here. This blog tour helps us learn more about each writer’s book, and in particular that all-important main character. Seven questions have been set. Evelyne has expertly tackled them on her blog, and now it’s my turn! 1 What is the name of your main character? Is he fictional or a historic person? Mike is fictional, but typical of many 9-year-old boys. He likes to think of himself as ‘Mike the Spike’, as he has tall spikey hair that he’s terribly proud of. Mike’s quite small but believes his spikes make him look tall and very grown up. It’s set in the modern day. Most of the action revolves around school and the average suburban home. Mike needs the approval and admiration of his peers. He’s a fiercely independent boy who likes to solve problems by himself, without adult help. This tends to get him deeper and deeper into trouble, with amusing consequences. Mike’s greatest source of pride – his hair – comes under threat. To his horror, he discovers he has nits. Mike is convinced his head will be shaved. How will he cope with the shame? He decides to get rid of them quickly, all by himself, before anyone finds out. 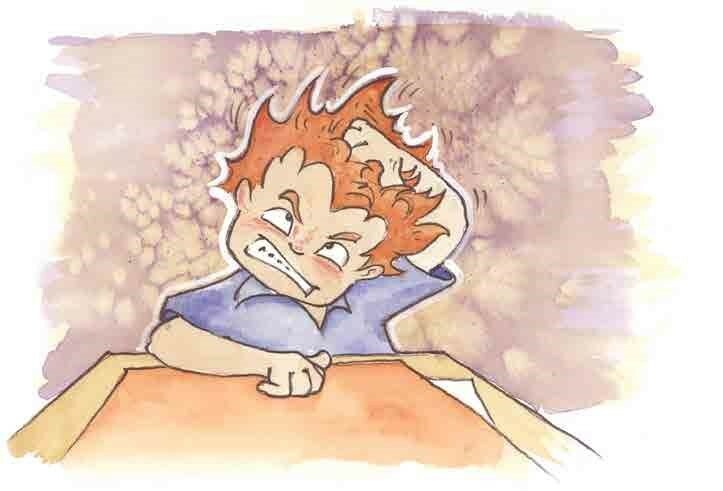 But as anyone who’s ever had nits knows … it isn’t easy. Mike has two goals. The first, of course, is to get rid of his nits. His other goal is to make a great non-spike-squashing hat for the upcoming hat parade. He’s never won a prize before and longs to win something, just this once. But how can he, when he can’t stop scratching? The junior novel is called Mike the Spike and it suits readers aged 7 +. Although it’s ostensibly about nits, it’s also about trust, self-reliance, and where you can turn when you need help. It’s being released in August! My publisher is New Frontier, and the book is being published as part of their Little Rockets series. This is a fast-paced series full of memorable characters, and I’m thrilled that Mike the Spike is going to join them. I’d like to invite Marcia Meara of the excellent Bookin’ It blog to take part in this blog tour. Marcia’s written a couple of books that I’d love to know more about. I’ve previously interviewed Pamela Cook, a rural fiction writer. She’s already had two novels published, is well into her third, and writes the inspirational Flying Pony blog. Dimity Powell is a fellow kids’ book author. Check out her blog Dimswritestuff. Stella, this is the coolest thing ever! Can I steal it and start one myself? Or partake in the all the fun? I love the idea. And I’m curious to know whether Mike manages to make that hat. Feel free to join the tour, Madhuri! Glad to have you with us, and I look forward to reading your post. As to whether Mike manages to make that hat … the result is totally unexpected … spoilers! Thanks! And please pardon me for just inviting myself to the party. I think I got so excited about the idea, I just lost myself for a moment. I’m so glad, Stella, that you took the time to join us on this friendly blog tour. Mike looks so cute! I’m sure many children will relate to him. It is wonderful to be part of a series. Will you have more Mike the Spike’s adventures or is it a single novel? You’re an inspiration for writers to keep up with our work, so I am now returning to my new YA story! But not before checking the writers you are introducing. Hi, Stella! I love Mike the Spike already. Just my kinda kid. And what a great way to help kids get past the misery and embarrassment they feel when a “round” of head lice is making its way through the school. (That’s what we call them here, nits being a term mostly reserved for the eggs. A regional difference, I imagine.) It happens every year, and one year, my daughter, who had the longest, thickest hair of any kid you ever saw, got them. I thought I would NEVER get them under control! This is just a super way to help kids feel better when it happens to them. I hope you have lots more adventures planned for Mike the Spike. The pictures are adorable, btw. Thank you so much for inviting me to participate in this blog tour. I had a lot of fun looking at my Swamp Ghosts heroine, Maggie Devlin, from some very specific angles. It was really a pleasure to answer the questions, and pass the baton along to the next authors.